There are approximately 160,000 restaurants in Tokyo. In 1995, the Japanese spent an average of $2,000 per person on food consumed outside the home, making them the world's biggest restaurant spenders. In contrast, Americans spent only about $950 per person and Europeans between $435 and $810. Japan has more restaurants per capita in part because people have so little room in their homes and go out when they entertain and socialize. Another reason is the restaurants are often small so there are a lot of them. Many restaurants in Japan have plastic models of the dishes they serve in the display window so that you can choose what you want, even if you don't know Japanese, by pointing. Viking-style means "all you can eat." Some restaurants and bars feature all you can eat and all you drink deals that often have a time limit of one or two hours. Bars and restaurants filled with cigarette smoke. At crowded, busy restaurants, sharing tables with strangers is common. Restaurants generally serve water or tea for free. Sometimes no napkins are available. 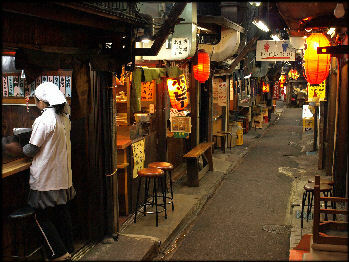 The main kinds of Japanese restaurants are: koryori-ya (similar to a pub with food); restoran (Western-style restaurant); ryori-ya (ordinary Japanese-style restaurant; soba-ya (noodle restaurant); shokuda (all-around eatery or cafeteria); chuka-ryoru-ya (Chinese restaurant); kissaten (sandwiches and soft drinks). Katei ryori (home-style restaurants) are small one-room affairs with a counter and may a couple of tables. Dishes are often displayed on the counter and you often share what you order. Most restaurants in Japan are specialty restaurants that serve one kind of cuisine or even one dish. 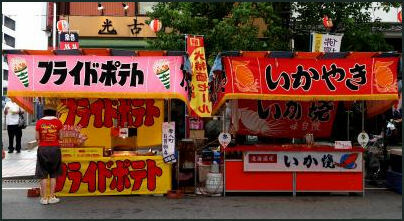 In large cities, restaurants that sell similar kinds of foods are often group together. There are many restaurants that specialize in sukiyaki, shabu-shabu and nabe. Here, diners cook their own food in front of them in their own pot, collective pot or open fire at their table and pick out what they want to eat with chopsticks. Some of these restaurants offer Kobe beef and other high quality meats. There are restaurants the specialize in tempura. Expect to pat between U$20 and $100 per person at these restaurants. The cheapest restaurants are noodle restaurants. Ramen shop often offer soups for around $5 and Chinese side dishes like dumplings. Soba and udon restaurants are little more expensive but not much. Their soups generally go for around $6 or $7. Dotour Coffee is Japan’s largest coffee shop chain. Mos Burger is a good burger chain. One of the cheapest meals is a bowl of rice sold with meat on top. It sells for as little as ¥300 in some places. Restaurants serving Italian, French, Chinese, Thai, Indian Korean and other ethnic cuisines are common. Chinese restaurants come in two varieties: Cheap neighborhood ones which all offer pretty much the same dishes and expensive one with fancy decors that specialize in multi-course meals. Avoid the French restaurants. They are famous for microscopic portions and astronomical prices. Italian restaurants are not much better. Izakaya are drinking restaurants. They offers a variety of drinks but generally serve mostly beer and to lesser extent sake and have a wide range of small, tasty dishes and snack food such as yakitori (small kebab-like foods), grilled fish and sashimi. Customers can sit at the bar, a table or on a tatami mat floor. Parts of the kitchen are often expose so customers can see the food items being prepared. There is a lot of interaction between the staff and customers. Izakyas are often identified by red lanterns outside their doors. Izakayas have traditionally been places were company employees drank with their work mates and young people gathered to party. Equal emphasis is put on eating and drinking. The food items come in small portions and are meant to be savored and shared. They are definitely tasty but some complain are overpriced. If you let you guard down and order too many you can end up with a hefty bill. Yakitori Bars are izakaya that specialize in yakatori. Tachinomiya are “new-style stand up izakayas. Robatayaki are drinking restaurant with grilled foods. They are similar to izakaya except they specialize in meats grilled over a charcoal fire. There are many places that specialize in okonomiyaki (meat-and-vegetable pancake eaten with a brown sauce and mayonnaise). Many of these places have griddle at the tables. Sometimes the pancakes are prepared at brought to your table. Other times a bowl full batter is brought to your table and you cook it yourself. Japanese are willing to wait in long lines and pay high prices for the best food. Jean-Luc Naret, global director the Michelin Guides told Reuters: “Restaurants here really focus on what they can do well, they really specialize. It takes time and take precision as well...I think Japan is the one country where you see the chef trying every day to do better than the day before with same materials and methods. They definitely try to excel.” It is not unusual to pay $500 for a dinner for two in Tokyo. And even then the portions sometimes seem abysmally small to Westerners. Kaiseki is cuisine originally reserved for the Japanese Emperor. A typical multi-course kaiseki meal at a fine restaurant features 34 dishes with at least 90 different ingredients. There are so many dished thas sometimes diners mistakenly eat the flower display. Kikunoi is a restaurant in Kyoto that specializes in kaiseki cuisine. A set meal served at the restaurant---which includes a single-piece of sea-bream sushi wrapped in a bamboo leaves, a tiny grilled ayu fish with water-pepper vinegar, fried prawns, bamboo-shoots with an egg-yolk and cream sauce and other dishes---is served in a minimalist setting, a tatami mat room with a single scroll of calligraphy and an alcove with a flower. Luxury restaurants are falling on hard times while eateries that offer cheap meals are doing well. The famous upscale restaurant Senba Kitcho in Osaka was forced to close after it was revealed that it reused food, such as uneaten sashimi or sweetfish broiled with salt’served first to one customer and then again to another customer. Senba Kitcho was one of the most expensive and well known restaurants in Osaka, with a meal for four often topping $1,000. It was also revealed that restaurant have served leftovers on a daily basis for 20 years and it intentionally mislabeled cheap beef as top of the line varieties. The Japanese are also quite fond of gourmet French food, baguettes and French pastries. Hokkaido produces its own version of brie; Tokyo has its own Café Flore, a Paris-based café popular with French actors and pop singers, and a restaurants run by the renowned French chef Joel Robuchon. The Japanese are also fond of eating French food in Paris. Robuchon told the Los Angeles Times that Japanese make up 15 to 20 percent of the customers at his Paris restaurant. A French restaurant in Tokyo---Les Creations de Narisawa, located in the Minami-Aoyama district---was named the 12th best restaurant in the world in 2011 on list assembled by the Italian beverage maker Sanpellegrino SpA. It was the third year in a row it made the list. It was 24th on the list in 2010. 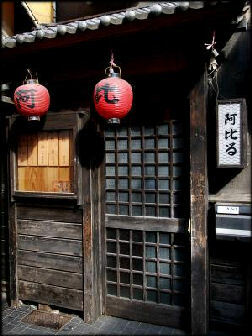 RyuGin, a Japanese-style steak house---placed 20th. It was ranked 48th the year before. The list is complied based on votes by 800 international chefs and restaurant industry experts. The Michelin Guide Tokyo 2008 was the first restaurant guide produced by Michelin for an Asian city. Released at the end of 2007, it topped the bestseller list in Japan and became a popular topic of conversation, especially the designation of restaurants with Michelin stars. The guide was put together based on information collected by five undercover Michelin inspectors who sampled 1,500 of Tokyo’s approximately 160,000 restaurants. Michelin gave its top ranking of three-star to eight Tokyo restaurants---the Japanese restaurants Koju, Kanda and Hamadaya, the French restaurants Qintessence, Joel Robuchon and L’osier and sushi restaurants Sukiyabashi Jiro and Sushi Mizutani. Sukiyabashi Jiro is an unusual choice in that it is located in a basement, shares a toilet with another restaurant and has no menu. Another 25 restaurants received two stars and 117 were awarded one star. According to the 2009 Michelin Guide Tokyo, Tokyo is far and away the world’s No. 1 gourmet city with 11 three star, 42 two star ones and 144 one star restaurants compared to 10 three star, 14 two star and 41 one star restaurants in Paris and five three star, six two star and 44 one star restaurants in New York. In the second edition of the Michelin guide for Tokyo, nine restaurants were awarded three stars, 36 received two stars and 128 got one star for a total of 173 restaurants receiving a total of 227 stars. Of the nine three-star restaurant, eight were listed before. The new addition was Ishikawa, a Japanese restaurant in Shinjuku Ward. The 2011 Michelin Guide for Tokyo list 14 three-star restaurants, making it for the forth year in a row the city with most three-star restaurants. The Ataki sushi restaurant leaped to three-star ranking in its first listing. Among the three restaurant that were promoted from two star to three star level was Usukifugu Yamadaya, which specializes in fugu. The other 10 Japanese restaurants were Esaki, Hamadaya, Ishikawa, Kanda, Koju, 7chrome Kyobashi, Sukiyabashi, Jiro Hontenn, Sushi Mizutani, Sushi Saito and Yukimura, the two three-star French restaurants were Joel Robuchon and Quintessence. Altogether Tokyo had 240 starred restaurants, including 52 with two stars and 174 with one star. Paris has 10 three-star restaurants, second to Tokyo, and 64 starred restaurants. One of the Michelin three-star restaurants in Tokyo was found to have possessed jars of black soy bean produced contaminated with a bacteria that can cause food poisoning, The jars were voluntarily recalled by their maker. No one reported getting sick. 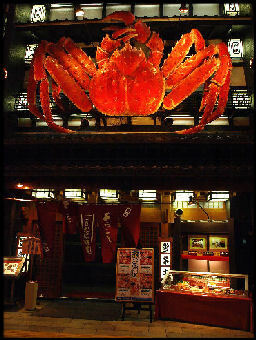 A Michelin guide for Kyoto and Osaka was released in October 2008. The 2011 Michelin Guide for the Kansai region listed 12 three-star restaurants’seven in Kyoto, three in Osaka and two in Kobe. “Statistics in a 2006 document prepared by Japan’s Ministry of Agriculture, Forestry and Fisheries (MAFF) estimate the number of Japanese restaurants worldwide at over 20,000, with approximately 10,000 in North America. The total number of Japanese restaurants in the United States is said to have increased by 250 percent in the past 10 years, and the number in the United Kingdom by 300 percent in the past 5 years. There were 900 Japanese restaurants in New York state, in 2007, two and half times more than in 1997. Japanese food first started to catch n the United States in the 1970s, primarily among the educated class and businessmen who traveled to Japan. The meals served at Japanese restaurants in the United States are usually adapted to American tastes. According to the MAFF statistics, more than 90 percent are managed by non-Japanese, such as Chinese, South Korean and Vietnamese. “Many of the Japanese restaurants found in malls and shopping centers across America serve sushi but their other selections generally resemble stir-fried Chinese food more than genuine Japanese food. Japanese restaurant chains are expanding all over Asia, particularly in Taiwan, China and Thailand. 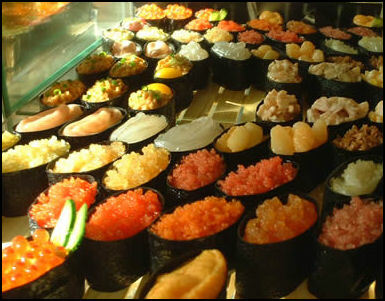 There are over 300 bars and restaurants in Moscow that serve sushi. About 90 percent of the Japanese restaurants in Paris are said to be Chinese-owned. Japanese restaurants in Latin American serve traditional rice bowl dished on plates normally used t serve sushi, pass off miso thrown in hot water as miso soup and offer sushi that give customers the runs. The Japanese government considered starting a certification system to designate restaurants as serving “real Japanese” cuisine and denying certification to restaurants that serve low quality sushi and other “corrupt” dishes, saying they damaged the reputation of Japanese food. The government ultimately abandoned the idea in the face of stiff opposition form various quarters and jokes in the foreign media about the “sushi police.” Italy and Thailand currently operate such systems for their own national cuisines. In a separate initiative, the Japan External Trade Organization (JETRO) is already providing support for an organization that inspects and evaluates Japanese restaurants in France. When many Americans think of Japanese food the first thing that comes to mind is Benihana, a chain of restaurants where meat and vegetables are sliced and prepared on grills by chefs who whirl and toss their knives around like baton twirlers and jugglers. The first Benihana steak house was opened in New York City in 1964 by Hiroki (Rocky) Aoki, a brash young Japanese entrepreneur who borrowed the name for the restaurant from his parents’ coffee shop in Japan . Incorporating the teppanyaki style of cooking that requires chefs to perform with enthusiasm and vigor before customers and adapted to American tastes for food and entertainment. Aoki is credited with popularizing Japanese food in the United States. He arrived in the United States in 1959 on an athletic scholarship. He lost the scholarship because of an injury but stayed on in the United States and opened an ice cream shop in Harlem. His green tea ice cream with a miniature umbrella proved to a big hit. The Benihana restaurants were also a hit and grew into a chain with 100 restaurants worldwide. 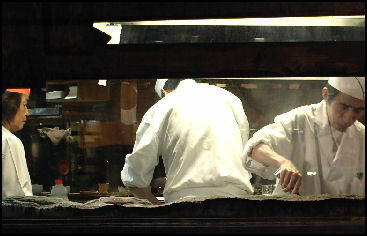 Aoki also operated a chain of sushi restaurants, mostly in the New York area. Aoki became a very rich man. He is credited introducing Japanese food to the United States and pioneering the theme restaurant business that has given birth to chains like TGI Fridays and Outback Steakhouse. Aoki didn’t limit himself to starting restaurants and making money. He was a member of Japan’s Olympic wrestling team, a driver in the notorious (and illegal) cross-country Cannonball Run and was the first man to cross the Pacific in a balloon. He accomplished that feat in 84 hours and 30 minutes, flying from Nagashima, Japan to Covelo, California. Midway through the flight he cooked a banquet dinner on a propane stove on the baloon. Aoki died in 2008 at the age of 69. In 2011 a Japanese chef “33-year-old Shinichi Sato of Hokkaido at a French restaurant---Le Passage 53---in Paris won a two-star Michelin ranking. There are lots American-style family restaurants, such as Royal Host and Skylark, that serve tonkatsu ("pork cutlet") and Japanese versions of Salisbury steak. Found primarily in the suburbs, they are popular with families that want a night out without spending much money. Yoshinoya is one of the largest fast food chains in Japan. They have about 1,000 outlets and specialize in dishes consisting of rice and meat in a bowl. A Yoshinoya beef bowl restaurant that opened in New York was closed in 2006. Mos Burger is a popular hamburger chain. Many Japanese worried about the impact of fast food on their lifestyle have embraced the slow food movement. The Slow Food Movement was founded in Italy in response to the opening of a McDonald’s in Rome in 1986. A Japanese is currently is its vice president. Members of the Japanese chapter get together and exchange recipes for traditional food and discuss what they can do about to halt the take over of fast food chains and genetically-modified foods. Bento box in the British Museum A bento box (or obento) is a lacquered wooden box with four small compartments for individual foods. 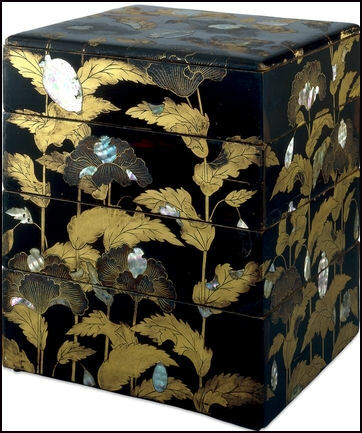 Used for serving food at many Japanese restaurants, as well as to take out meals made at home, it was derived from a farmer's seed box by Japanese cooks in the early 20th century. Most bentos have individual compartments for meat or fish, rice, and pickled vegetables. An obento was described by the writer Anne Allison in her book Permitted and Prohibited Desires as “a small box packaged with a five- or six-course miniaturized meal whose pieces and parts are artistically and neatly arranged and perfectly cut.” Making one takes at least 20 minutes to properly cut, organize and display. Preparation tools can include tweezers and a razor knife. Bento-style meals have been traced back to the Muromachi period (1333-1568) and Azuchi-Momoyama period (1568-1598) when samurai families, nobles and others took them when they traveled to the countryside or attended seasonal events. The meals are said to have been popularized in the Edo period (1603-1867) and industrialized and mass produced beginning in the Meiji Period (1868-1912). Bento is also used to describe school lunchbox lunches and quickie lunches in plastic containers, with disposable chopsticks, sold at convenience stores. They are eaten on trains, in parks, in classrooms and in offices across the nation every day. Many nursery schools require mothers to make them for their children and many wives make them for their husbands. The bento box industry was thrown for a spin when many train station food stands began selling California-produced bento lunches for about half the price as Japanese-made bentos. Customers seemed pleased with the price and the quality. Japanese bento producers were upset. Mothers are often judged by how well they prepare their child's o'bento, an "honorable lunchbox" which usually contains fresh peas, boiled eggs, lotus roots, mint leaves, tomatoes, carrots, fruit salad, minced chicken, seaweed is cut into teddy bear shapes and fluffy white rice with a plumb in the middle (symbolizing the rising sun on the Japanese flag). For women having trouble there is a two volume illustrated book with tips for o-bento making plus numerous websites on the topic. Mari Miyazawam the host of a popular website “e-bento.com” shows mothers how to sculpt dinosaurs from rice colored with egg-yolks with an eye made of sliced cheese and strips of seaweed, teeth made from bits of cheese put in place with tweezers and adorned with star-shaped okra. Decorations often have a seasonal theme: fireworks in the summer, snowmen in the winter. Others recreate cartoon characters or famous people. In Japan you can find McDonald's, Denny's, Outback Steakhouse, TGI Fridays, Mister Donuts, Pizza Hut, Subway, Friendly’s, and Domino's Pizza. The menu is sometimes a little different. Mister Donuts sells steamed buns and noodles as well crullers and donuts. Pizzas offered at Pizza Hut and Dominoes as well as at Japanese chains are topped with things like squid, octopus, tuna, crab, asparagus, peas, sweet corn and mayonnaise. Japanese adaptions of Western food--- known in Japanese as yoshoku---include naporitan (ketchup-flavored spaghetti), omu-raisu (rice omelet) and hangug (hamburger paddy meatloaf with a brown sauce). Tonkatsu (pork cutlet”) is an adaption of Veal Cotelet, a French menu item, that was modified because veal gave Japanese heartburn and grated cheese was replaced with breadcrumbs, with the whole thing being deep fried like tempura and served with heaps of shredded raw cabbage. Omu-raisu was developed from leftover restaurant food for the staff to eat. Many of these dished were concocted during the Meiji period at a restaurant in Ginza called Renga-eto that started out as a French restaurant in 1885. Many old timers remember American soldiers handing out Hershey bars and Wrigley's chewing gum after World War II, when food was very scarce. It was also during the American occupation that thing like bread and milk appeared at school lunches and Japanese tried cheese and hamburgers for the first time. Kentucky Fried Chicken was the first major American fast food chain to appear in Japan. It arrived in 1970 as a joint venture between Pepsi Cola and Mitsubishi. McDonald’s arrived in 1971.There are now about 1,120 Kentucky Fried Chicken outlets nationwide. It is so popular that one year it won the contract to cater "The Prime Minister Cherry Blossom Viewing Party." The Hard Rock Café opened in Tokyo in the 1980s. There are now Hard Rocks in Osaka, Kobe, Yokohama, Nagoya and Fukuoka. You can also find New York-style delis, California-style restaurants and Texas barbecues. Taco rice---made with taco meat, sauce, lettuce, avocado, cheese and eggs---is very popular in Okinawa and is gaining a following elsewhere in Japan. Not long ago Korean kimchi was widely disdained but not it very popular, outselling popular Japanese pickles such as takuan and umeboshi. Akinari Makishima, who works at an Italian restaurant in Nagoya, won an international championship for making traditional Neapolitan-style pizza in a competition in Naples. He is the first Japanese to win such a competition. McDonald’s is Japan’s largest hamburger chain. 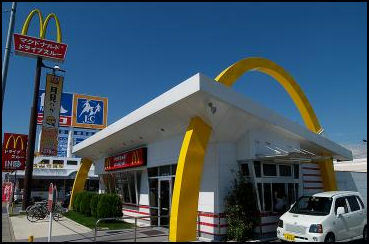 There were 3,826 McDonald's in Japan in 2007, the second largest number after the United States. In some cases there are two or three in the same shopping complex. In addition to Big Macs and French fries, McDonald’s in Japan offer teriyaki burgers and cheeseburgers with burdock (a kind of Chinese vegetable) sauce. Japanese went crazy about the Mega Mac, with four beef patties. Over 1.7 million of them were sold in four days, For many years the McDonald’s advertising campaign promised free McSmiles. McDonald's controls about 60 percent of hamburger market in Japan. It serves about 1.2 billion hamburgers a year, or about 10 for every Japanese person. The Japanese unit of McDonald’s gives the McDonald’s Corporation in the United States a 1 percent royalty. The owner of McDonald's Japan is one of the richest men in the country. McDonald’s Japan recorded its highest monthly sales ever in March 2007 (¥43 billion) at its 3,826 restaurants. Later McDonald’s decided to raise prices in urban areas and lower them in rural areas. McDonald’s recorded record sales in the first half of 2009. It made a record profit of ¥12.8 billion in 2009. In 2006, after a five-year absence, Burger King said that was it going to return to Japan in mid 2007 and hoped to open 100 outlets within five years. Burger Kings previous venture in Japan, from the mid 1990s to 2001, ended after a price war with McDonald’s that resulted in weak sales and low earnings. In 2009, Wendy’s announced that it was leaving Japan after a 29 year presence in the country. Mayonnaise is a food that was practically unheard of a generation ago. It first appeared after World War II as a topping for Osaka-style squid pancakes. Later a dollop was placed on some kinds of sushi. Later still, mayonnaise became common place and children got so into it they have become known as the mayonnaise generation, adding mayonnaise on all sorts of things. Eichi Urata, an amateur climber, got stuck on a 7,700-foot mountain outside of Nagano for 15 days and survived on two tubes of mayonnaise. Today, Japanese plastic food makers produce sweet and sour pork, miso soup, toast, glasses of orange juice, strawberry parfaits, bento-box soba noodles, sundaes with peach slices and sweet beans, fillet mignon, fried eggs, chocolate mouse, French pastries and even Big Macs, spaghetti Neapolitan with floating utensils that sell for $400 and fresh plastic salmon that goes for $1,300. Iwasaki Co. Ltd. is Japan's largest plastic food manufacturer. Most items are made in silicon or metal molds (formed from real food) and then painted by hand. Other techniques are also used to make food. A head of lettuce, for example, is made a leaf at a time from hot wax placed in cold water. Items not found in the Iwasaki's 200-page catalog can be custom made. Easy-to-make items include beer (gold-tinted glycerin and gelatin poured in a plastic tankard) and food "parts" like mushrooms, peppers and cucumber slices. Tempera and sushi require more skill to get the painting right, and only the most skilled "chefs," with ten or more years of experience, tackle difficult-to-make items like air-brushed croissants, pealed mandarin oranges and whole fresh fish. Iwasaki Co. was founded by Minoru Iwasaki, who is sometimes credited with transforming the plastic food business from a craft into an art form. He said he got the idea for his plastic food from Buddhist funerals. where foods fashioned from wax were given as offerings. His early fake food was made from wax but now most of it is made from polyvinyl chloride. Some of Iwaki's pieces have been displayed at an art gallery in New York.